A chronograph with second time zone function, the 4810 TwinFly Chronograph has an in-house movement and mid-range price tag. 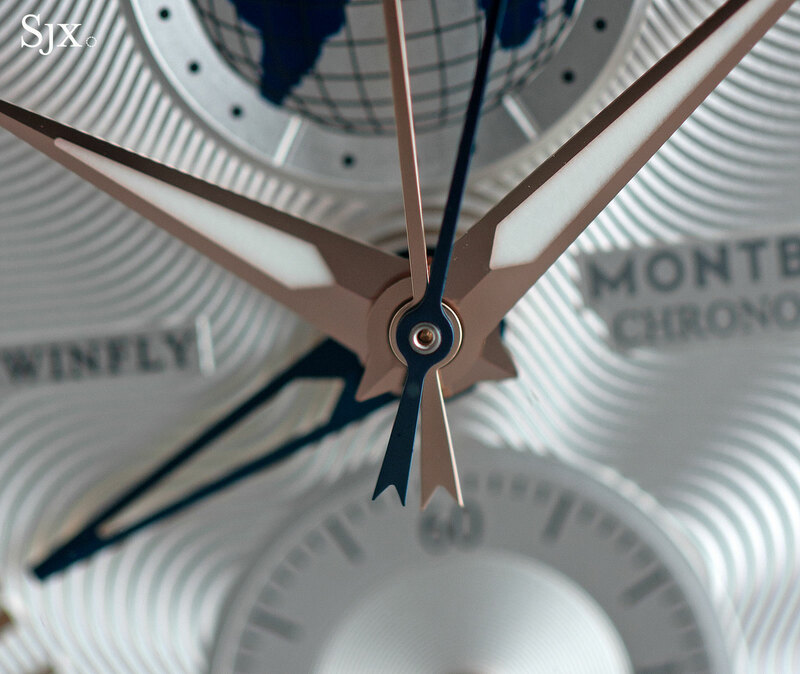 Montblanc‘s current strategy when it comes to watches is to offer as much as possible for relatively affordable money, especially compared to the competition. Named after the height in feet of the Mont Blanc peak in the Alps, the 4810 collection unveiled at SIHH 2016 exemplifies this, offering elaborately designed dials and complicated movements. The 4810 TwinFly Chronograph 110 Years Edition sits in the middle of the collection price-wise, a step up from the basic watches but less pricey than the top of the line tourbillon. And it’s arguably the most interesting, being a flyback chronograph with a second time zone and date, and powered by the in-house MB LL100.1. 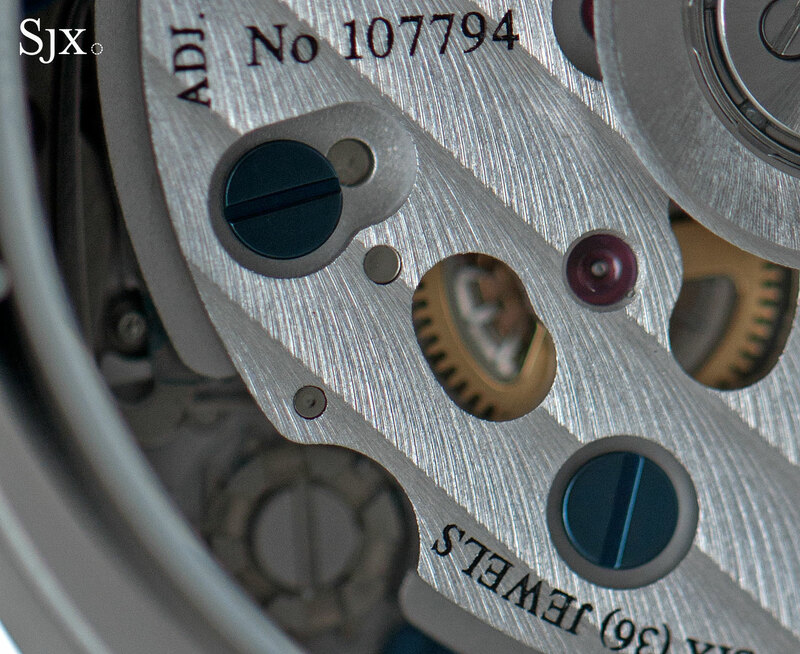 Not a new movement, having been launched with the TimeWalker TwinFly five years ago, the MB LL100.1 is nonetheless interesting. It has the unusual feature of having both the elapsed seconds and minutes of the chronograph on the same axis as the hour and minute hands, a feature historically associated with military chronographs to improve legibility. That explains the numerous hands, five of them in fact, in the centre of the dial. That configuration should make the dial less busy, since it eliminates the need for chronograph registers, but the fancy design of the dial reverses that somewhat. 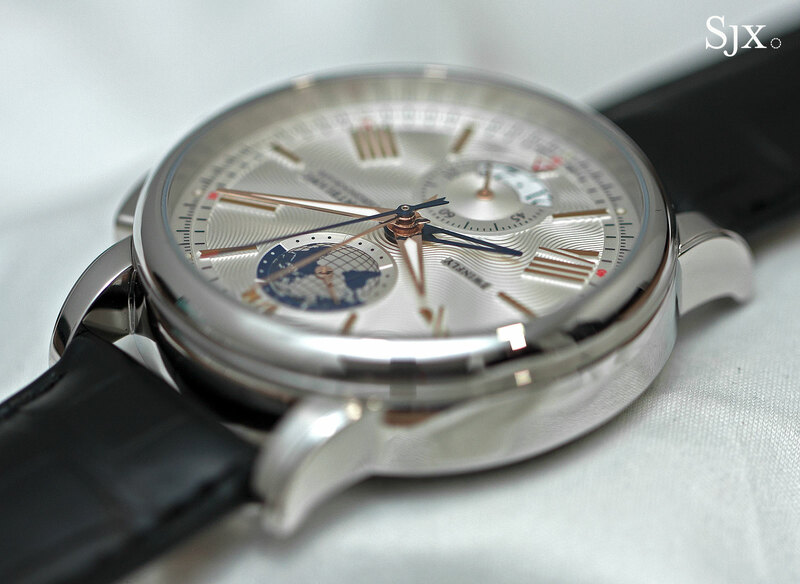 The dial is elaborately styled to give it an expensive look, with prominent guilloche and gold hour markers. 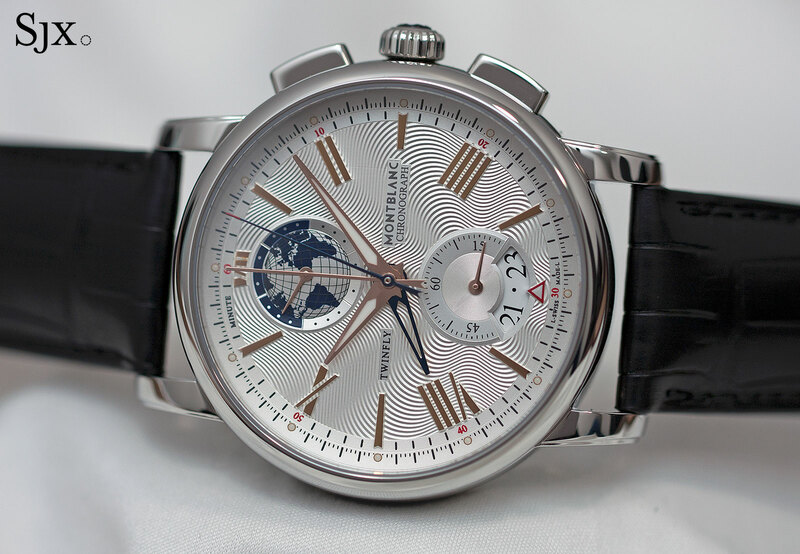 The second time zone is indicated by the short blued hand in the centre, read in conjunction with the sub-dial at 12 o’clock to distinguish between day and night. Constant seconds and the date are at six o’clock, with an extra-wide aperture for the date that shows not just the current day, but the date before and after. 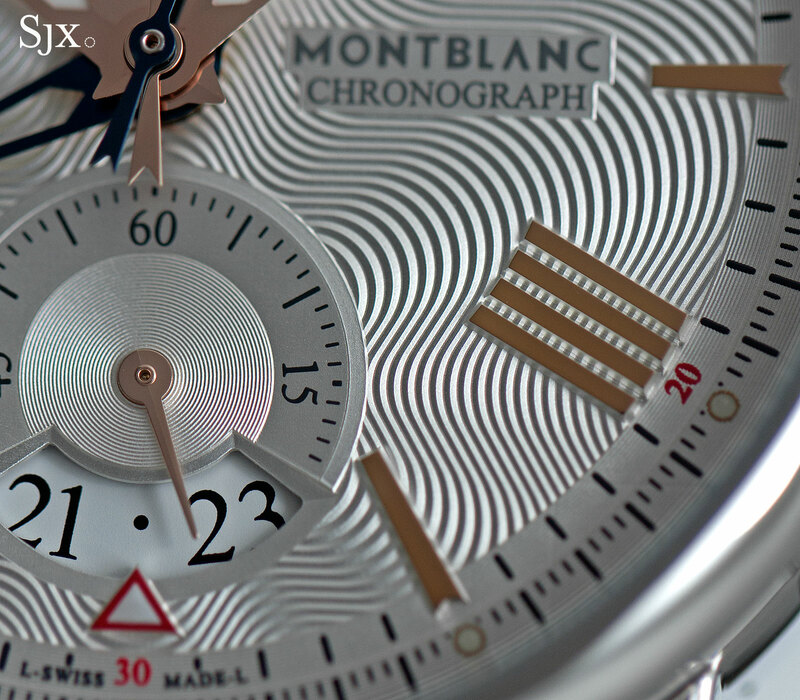 Though it is heavily decorated – the wavy guilloche is actually the Montblanc star logo in progressively larger repetition – the dial is simply made, being a single, stamped piece. Though they resemble applied markers, the hour indicators are actually part of the dial, produced via stamping. 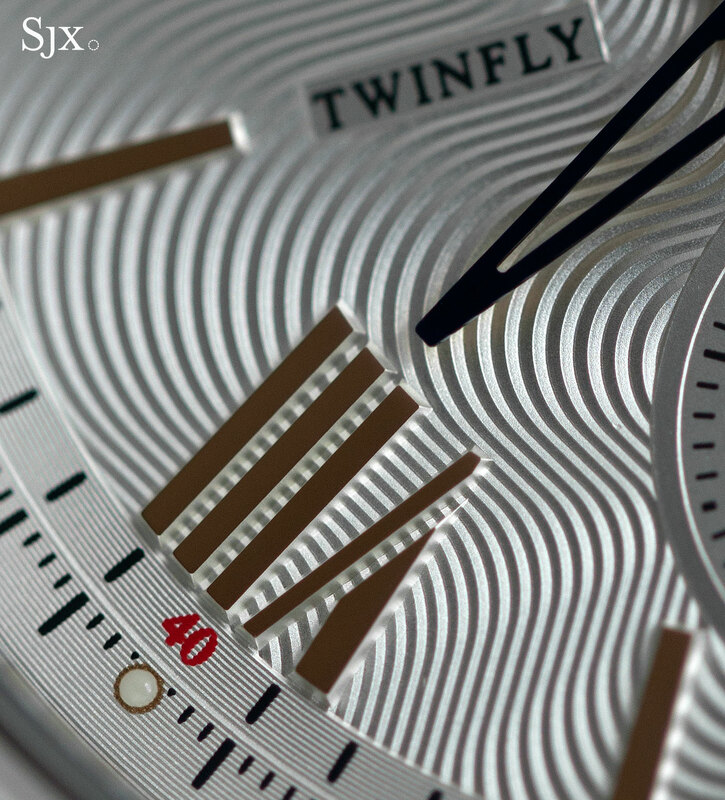 This is a smart and cost efficient way of making an attractively detailed dial. 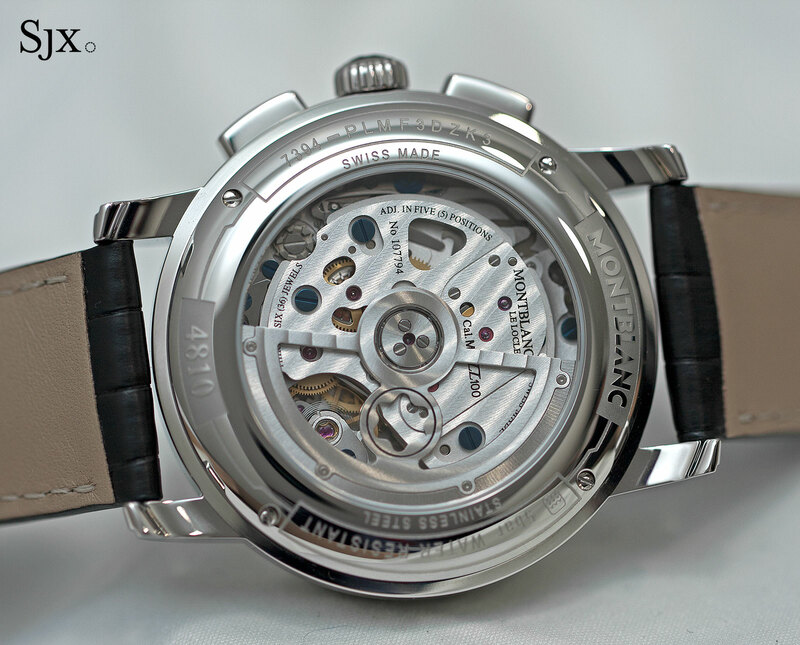 The movement inside is Montblanc’s own calibre MB LL100.1, an automatic, integrated chronograph movement with a useful three-day power reserve. 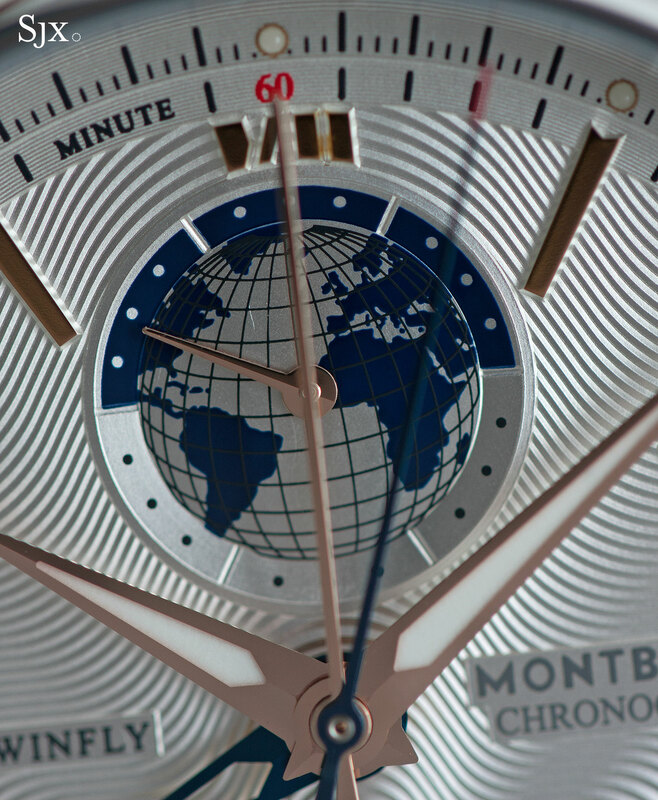 The “LL” prefix is short for Le Locle, the town where Montblanc’s factory is located. A large movement, the same thickness and a bit wider than the common Valjoux 7750, the MB LL100.1 has been dressed up with decorative finishing. As with many watches in this price segment, the finishing is basic and done by machine, but nonetheless visually attractive on casual examination. Bridges are finished with striping and screws are blued, with most of the mechanics below hidden. It’s worth pointing out that the lettering on the movement bridges is printed rather than engraved, making it less appealing. The watch is quite large, being 43mm in diameter and almost 15mm high, while the white dial and narrow bezel accentuate the perceived size. The case is relatively simple, with a polished finish on all surfaces and rounded edges. Whether or not the 4810 TwinFly is a good buy depends on the definition of value for money – as much as possible but executed in a basic manner, or as little as possible but done expensively. 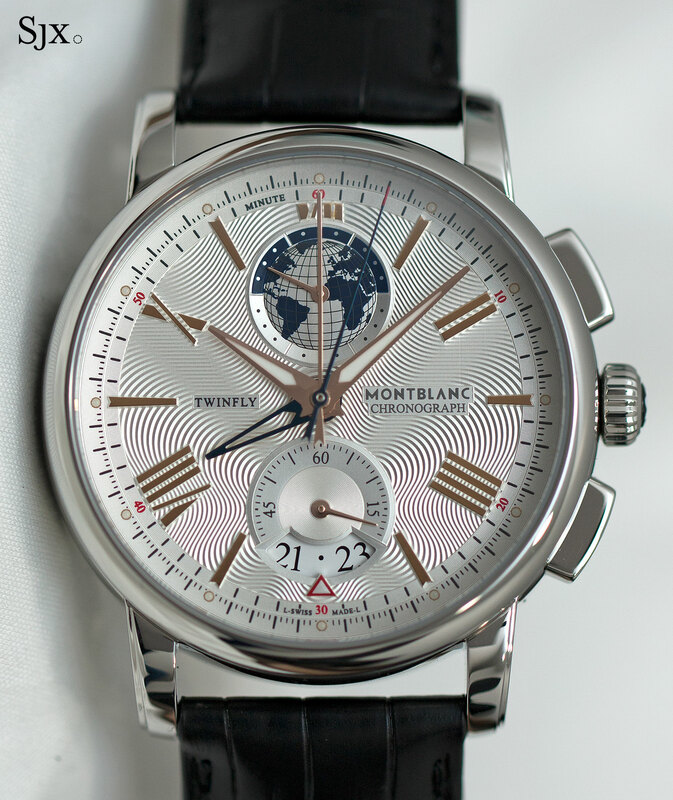 In fact, it brings to mind the Montblanc Heritage Chronometrie chronograph with annual calendar, another watch that does a lot for relatively less money. Limited to 1110 pieces, the 4810 TwinFly Chronograph 110 years Edition is priced at €6900 or S$10,800, equal to about US$7600, and will be available starting in the third quarter of 2016. The Heritage Chronométrie Collection Chronograph Annual Calendar does a lot while costing relatively less. How good is it?